At the latest Casey Research conference, respected investment analyst Porter Stansberry stood at the podium and predicted that the price of oil will fall below US$40 per barrel within the next 12 months. Part of his reasoning revolves around the impact that the shale gas revolution has had in the United States – he believes a similar thing will happen with oil. Porter is a friend of mine and a very smart, successful individual… but I think not. From my perspective, the pressures at play in the oil market are all pushing prices in the opposite direction: up. Global supplies are tightening, costs are rising, and demand is not falling. Prices are going to remain high, and then go higher. And there will not be a shale oil revolution anytime soon. I'm the kind of guy who puts his money where his mouth is, so I challenge Porter to a bet. I bet Mr. Stansberry that the price of oil will stay above $40 a barrel over the next 12 months. The wager? 100 ounces of silver. Porter has made a lot of good calls in his career. I highly recommend watching his video The End of America, an interesting and entertaining look at his prediction that the US will soon drown in its debts and cease to be a global economic powerhouse, a transition that will lead to riots across the country. Porter and I agree on a lot of things, but on this one he's wrong. Below are my top ten reasons that high oil prices are here to stay. Another example? The Cantarell field in Mexico, which produced 2.1 million barrels per day in 2003, produced just 400,000 barrels last month, a staggering decline of more than 80% in just nine years. To maintain output levels, producers need to consistently invest huge amounts of money and time in exploration, development of new areas, and engineering and utilizing new technologies to extend oil field lifespans. All of this costs money, and lots of it. Of the Seven Sisters of Declining Exports, six are countries where the oil machine is run by a national oil firm. That means that revenues from oil exports belong to the government… and those governments are stuck between a rock and a hard place. They know they need to direct the oil revenues back into their fields very soon, before they decline beyond the point of repair. In the meantime, production levels continue to fall. Compounding the problem of declining production is the fact that most of these countries have long relied on cheap domestic fuel prices to keep their citizens happy. This has spurred rising consumption in many oil-producing countries, including Saudi Arabia, Iran, Nigeria, United Arab Emirates, Venezuela, and Kuwait. With domestic consumption climbing and production falling, these countries have less oil available for export every year. But here's the hard place: oil export monies make up the vast majority of each government's revenue. They need to sell oil on the international market in order to fund their day-to-day operating expenses. And their operating expenses are sky high: these governments constantly make new social-spending promises to appease their masses; and since their populations continue to grow, these commitments grow larger with each passing day. Venezuela is a prime example. Hugo Chávez owes a big chunk of his popularity to the domestic fuel subsidies that render fuel prices in Venezuela among the lowest in the world – it costs just US$0.18 per gallon to fill up in Venezuela, and that's ridiculously expensive compared to the US$0.05 per gallon it cost a year ago. Yes, that means you could have filled your car for $1 in Caracas. Getting rid of these fuel subsidies would solve part of the problem, but it is simply not doable – it is not just political suicide, but a sure-fire way to incite riots and social unrest. Just a few months ago Nigeria's government tried increasing domestic gas prices; the country rapidly descended into violence as protestors demanded a return to subsidized fuel. The government relented within days. Fuel subsidies are not the only expensive item on many a government's social-spending list. Housing, food, health care, education – these are all burdens that socialist-tending governments take on to cement support. Social spending is a great way to make yourself popular with your citizens, but it is also a great way to bankrupt your country… unless, of course, you can sell oil at high prices to other countries. According to our analysis, OPEC nations need the price of oil to stay above $60 per barrel to pay for all their social programs. In other words, they need $60+ oil to stay in power – and you can be certain they will do everything necessary to make sure this happens. Oil export prices must increase. Natural gas and oil are both hydrocarbons, and analysts frequently discuss the two as if they are one and the same, but they are very different commodities with completely separate market mechanics. To summarize: oil is a global commodity while natural gas is a regional commodity. Natural gas can only travel via two methods: through pipelines and as liquefied natural gas (LNG). Engineers have come a long way in building pipelines that traverse thousands of miles or run underneath bodies of water, but pipelines are still limited in their usefulness – we're never going to build a pipeline from Norway to Japan, for example. The only way to transport natural gas across oceans is as LNG. In its gaseous form, natural gas takes up far too much room to ship economically, so LNG is natural gas that has been condensed to liquid state. On conversion into a liquid the volume shrinks to just 1/600 of its original size, making it economic for transportation. Unfortunately these liquefaction plants easily take several years and billions of dollars to build. Also, not all gas-hungry countries can take LNG – they must have a regasification facility that accepts the LNG, turns it back into a gas, and sends it through pipelines to consumers. Many energy-hungry countries, such as Japan, Korea, and Taiwan, have built the necessary infrastructure and are taking all the LNG they can get their hands on. Their competition for LNG cargoes has driven LNG prices far above basic natural gas prices. A quick comparison: Japanese natural gas trades at $16.8 per MMBTU, whereas Henry Hub trades at just $2.11. What does this mean? Countries with natural-gas-liquefaction facilities are able to get top dollar for their gas in the global market, while countries without LNG capabilities are at the mercy of regional supply and demand. What about the United States? The United States has no LNG liquefaction plants – the last operating facility, the Kenai plant in Alaska, closed in 2011. This means that the flood of shale gas production in the US will continue to overflow storage facilities and depress US natural gas prices, because domestic demand is not rising as fast as production and there is no other way to get the gas to customers across the oceans who want it. Oil, however, is a very different story. A barrel of oil produced in Saudi Arabia can be shipped to the United States and sold on that market. This means that if oil cost $10 in Saudi Arabia and $50 in United States, some enterprising business would take oil from Saudi Arabia, ship it to the United States, and sell it for a profit. Of course, the real picture is a bit more complicated than that. Prices do differ somewhat from place to place – Western Canada Select crude, for example, currently sells for $88.98 per barrel, while Brent Crude is priced at $119.17 per barrel – but such divergences simply reflect the costs and constraints of transportation and the range of crude-oil qualities. The general idea is that oil is a global product. As such, dramatic increases in supply in one part of the world can be sold off elsewhere in the global market, creating much less impact on the producing region than with regionally constrained natural gas. This means that while a rapid increase in natural gas production pummelled gas prices in North America, the same would not happen to oil prices in North America or elsewhere if US oil production suddenly jumped. An example might help put things in perspective. US natural gas production grew by 30% in the past five years due to the shale gas revolution. If US crude oil production grew by 30% overnight, that would add three million barrels a day to global production. Even though this sounds like a lot of oil, it would represent just 4% of the global supply. World crude oil production rose 4% from 2003 to 2004. What happened to the price of oil? One of the main arguments Porter uses to support a falling price of oil is that the world's newfound abundance of natural gas is providing an alternative fuel for the future. While there is some truth to that statement, there are more caveats than certainties. There is no way natural gas will replace even a fragment of oil demand during the time frame in question, which is the next 12 months. Oil is entrenched as the world's mainstay fuel; gas has always been second or third on the list of energy-resource importance. Changing the ordering on that list will take decades, if not generations. How many natural gas fueling stations do you drive past on your way to work? Not many, I'd bet, especially compared to the number of gas stations in your neighborhood. Do you see that ratio changing much in just 12 months? In addition, it's easy to forget that we rely on oil for far more than just fuel. Look around you – chances are good that at least half of the items you see from wherever you're sitting include at least some oil. We use oil for concrete, shingles, pipes, ink, synthetic fabrics, crayons, computer cases, carpet, paint, Styrofoam, shampoo, helmets, electrical insulation, toothpaste, lipstick, tires, rope, fertilizer, candles, adhesives, refrigerants, artificial turf, pill capsules, soft contact lenses, shaving cream, antifreeze, antihistamines, insecticides, fan belts, hand lotions, caulking, golf balls, credit cards, Formica, footballs, bandages, medical tubing, packing tape, and many, many more items. Oil is a deeply ingrained part of how our world operates, and demand will continue to rise with population for many decades to come. It will take many years for natural gas to even start to supplant oil as the dominant fuel. Natural gas will play a growing role in the world's energy scene, but the timeframe for the shift is very long. Twelve months from now natural gas prices in North America will still be depressed and global oil demand will be almost the same as it is today. I believe we are in the early stages of the “Decade of Resource Nationalization.” As supplies tighten, natural resources of all kinds will become more and more valuable. Whether to control additional revenues or to secure domestic supplies, governments will nationalize natural resources with gusto. The latest example of this is Argentina. A beautiful country with incredible geological potential, Argentina's resources are wasted on a government that is simply unable to incentivize private investment in the country. Now the government is going to try to develop its technologically challenging oil fields alone, and mark my words it will fail. YPF may be the first casualty in Kirchner's oil and gas nationalization spree but it will not be the last, as there is widespread enthusiasm within Argentina for further expropriation and nationalization within the sector. Today's enthusiasm will become tomorrow's disappointment as Argentineans taste the bitter reality that government resource nationalization almost always ends badly. Kirchner is nationalizing Argentina's oil sector directly, but lots of resource nationalization is done in much more roundabout ways. These devious methods include: increasing the tax levied on oil production (United Kingdom); introducing a windfall tax (Ecuador); or suddenly adding capital-gains tax to sales of oil projects (Uganda). In all these cases, the governments wound up with more money while the oil companies and their investors got stuck with the bill. “Big bad oil companies” are frequently made the bogeyman, but in reality profit margins for oil production keep getting slimmer and slimmer – and the real bogeyman is often a greedy government. Whether a government is direct or covert about its desire to nationalize its resources, the results are the same for global resource explorer-developers: increased risk. It doesn't take long before the risk-reward balance becomes skewed toward risk and companies begin to pack up and leave. Guess where that leads? To lower production volumes and higher prices. Porter argues that a global shale oil revolution could push production volumes way up and prices way down, but this argument assumes the world has the infrastructure to power such a revolution. That is simply wrong. It is not easy to drill an economic shale well, whether for oil or gas. To get the most out of a shale formation, an operator often needs to use a high-power – over 25,000 horsepower – frac drill set. He has to drill horizontally, which is far more technical and challenging than drilling vertically, and then has to complete multiple fracs to get the well flowing. North America has more energy infrastructure than anywhere else in the world, resulting from years of conventional oil and gas development and production. In North America it is relatively easy to find drilling companies armed with these high-power frac sets, but such is definitely not the case in most other parts of the world. Europe, for example, is home to fewer than one-tenth the number of drilling and fracking sets as there are in North America. That means any shale revolution in Europe would take a very long time to develop –the equipment and expertise just aren't there. Yes, shale gas production ramped up quickly in North America, but we had the infrastructure in place and just needed to adapt it to a new kind of geology. The head start means North America is now more than a decade ahead in a sector that Europe has just begun to understand, and one that Russia still refuses to believe. It is safe to say that it will take a very long time for the shale revolution to have a major impact in Europe and elsewhere. In the best-case scenario, we believe Europe will only have a small amount of shale production of any type twelve months from now. The IEA estimates it costs between $4 and $6 to produce each barrel of oil from the conventional fields in Saudi Arabia and Iraq, including capital expenditures. Algerian, Iranian, Libyan, and Qatari fields cost slightly more, at about $10 to $15 per barrel. These countries produce most of their oil from relatively easy, straightforward, conventional deposits. My perspective on energy resources revolves around the fact that there are no more of these big, easy deposits to be found. The deposits of tomorrow are harder to find and more complicated, expensive, and risky to develop. Companies now have to manage the litany of challenges inherent in getting oil out of places like the oil sands, sub-salt deposits, and ultra-deep offshore reservoirs. With increased difficulty comes higher production costs. This also means that if oil prices fall too low, costs will overwhelm revenues and production will shut down altogether. The Canadian oil sands are a perfect example. Producing projects in the oil sands need an oil price of at least $60 per barrel to remain economic – and that assumes capital costs have already been repaid. To build a new oil sands project, a producer needs to believe prices will remain high enough to cover not only his basic production costs but also to repay his huge capital outlay. As such, new oil sands projects are uneconomic to develop without an oil price of at least $85 per barrel. The oil sands are by no means the only important oil region with high production costs. To access most of the world's unconventional oil resources, companies need to drill horizontally, which costs much more than drilling vertically. After drilling horizontally, producers have to frac the well in many stages to achieve commercial production. This means each well costs many million dollars, an expenditure that is not going to be economic at $40 oil. What is more, these wells decline much more rapidly than conventional wells. 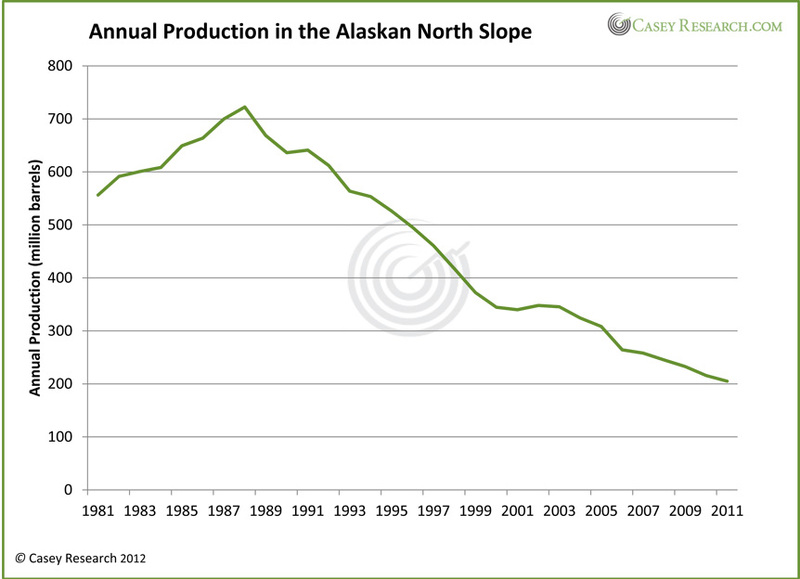 Production from any well falls with each passing year, but with unconventional wells the decline can be dramatic. In fact, shale wells typically decline by more than 50% after their very first year. To maintain production, companies need to be constantly drilling and commissioning wells, a treadmill process that increases the production costs significantly. In the world of unconventional production, companies are faced with a double whammy: they need to drill more wells than a conventional field would require; and each well is much more expensive. Companies are not going to bother with this challenge if low prices make it a money-losing endeavor. Once production begins to shut down, the world will panic and the price of oil will turn upward once again. The world is not awash in oil. On the contrary – we produce only just enough oil to meet global demand. With the world's population growing every day demand continues to rise, making the balance ever tighter. Even the threat of major production cuts of the sort we just discussed – which would surface the moment the oil price fell to $85 per barrel – would be enough to send tremors through the global oil machine and push the price of oil back up. It is not only traders who will react to push prices back up. Countries will jump at the chance to secure oil supplies on the cheap. You see, for the oil-needy nations of the world, having to constantly walk this supply-demand tightrope is far from ideal. Far preferable would be to control of enough oil deposits, at home and around the world, to meet national needs. With nation after nation coming to this realization, the race is on to secure energy supplies. China is the biggest player in this arena. Armed with a massive bank account, the Chinese are seizing every chance they get to buy major deposits. If the price of oil starts to slide, as Porter suggests it will, the value of major oil projects will decline as well and the Chinese will act, buying up any reduced-price oil deposit they can find. Acquisition activity like that will push prices back up again, if for no reason other than that people will remember the finite and declining nature of our world's oil reserves. I also think the starting gun has already gone off in the global race for uranium, but that's a story for another day. If exploration drills find an oil deposit, data from those drills are used to calculate a “resource estimate,” which is a geologic best-guess of how much oil the formation holds. However, oil in the ground is not necessarily oil that will ever see the light of day. That's where the “reserve estimate” comes in. Reserves are an estimate of the amount of oil within a deposit that can be extracted economically. Let's look at both of those words: “extracted” and “economically.” Whether oil from a deposit can be extracted depends on the geologic parameters of the deposit and the technical abilities of today, which combine to determine how much of the deposit is “technically recoverable.” Then the “economically” part of the description comes into play. Oil is only “economically recoverable” if the cost of production is less than the price of oil – put simply, the producer has to be able to make a profit. Remember, my outlook on energy resources is based on the premise that most of the easy deposits are gone. In general, only the hard-to-find and expensive-and-complicated-to-produce deposits remain. Producers cannot make money from these challenging deposits if oil is cheap, which means reserves will revert to being uneconomic resources. Examples abound. It costs far more to produce a barrel of oil from the deepwater Gulf of Mexico, Canada's oil sands, Russia's Arctic waters, Estonia's oil shales, or Brazil's deepwater sub-salt deposits than from the big, conventional oil fields of yesterday, like those in Texas or Saudi Arabia. Oil reserves in these places will evaporate if oil prices fall and render them uneconomic to develop. The world's oil resource count will remain the same, but resources are useless if we can't get them out of the ground. The world uses a lot of oil. All of that oil has to come from our finite pool of oil reserves. A falling oil price would gradually eliminate that pool, because the cheap oil is gone. And that simply doesn't stand up to supply-demand logic. One reason that North-American gas producers continue to drill select wells is because certain shale reservoirs contain lots of Natural Gas Liquids (NGLs). These liquids, comprised of bigger carbon molecules than the methane that is natural gas, trade at a significant premium to natural gas. Furthermore, these NGL-rich natural gas wells often also produce some oil. The presence of these bonus products means producers in NGL-rich areas can continue to operate because revenues from the sales of by-product NGLs and oil compensate for rock-bottom natural gas prices. The result is upside-down – for these operators natural gas is still the primary product by volume but is the least-important product by value – and ironic, because by continuing to add to the natural-gas supply glut in North America their gas output is actually perpetuating the gas pricing problem. But the point is that the price of gas doesn't matter: as long as the NGLs and oil continue to flow out of these wells, the operator will remain profitable. A similar paradigm does not exist in an oil well with natural gas as a by-product, because of course gas is worth far less than oil. If the price of oil began to fall dramatically, companies would simply stop drilling and there would be no upside-down by-product incentive to continue. A “black-swan” event is a rare but highly significant event with dramatic impact. The collapse of Lehman Brothers, the Arab Spring, and the Fukushima nuclear disaster are all examples of black-swan events. These events tend to tilt more in favor of a rising oil price. Consider this: the loss of oil production from Libya – which represented just a small fraction of the world's production – caused the price of oil to move 25% in just two months. As we have mentioned before, the world produces barely enough to satisfy global demand at the moment. That is precisely why any significant impact on the supply side generally shocks the market disproportionally. And there are a good number of possibilities that could quite easily occur that would send the price of oil much higher: a war with Iran; OPEC reducing production levels; terrorist attacks in Nigeria; renewed social unrest in the Middle East… the list goes on. The point is: if something goes wrong geopolitically in the world, it is more likely than not that oil will begin shooting up. And there you have it – ten reasons why the price of oil will not hit $40 a barrel in the next 12 months. Porter, I respect your opinions and consider you a friend but, just like I took your money in our poker game, I look forward to laying my hands on your 100 ounces of silver, should you accept my challenge.